Two letters to the editor in the Brandon Sun issue dated June 15 expose Manitoba Pork Council’s admission to being responsible for contributing 1-1.5% of the phosphorus load in Lake Winnipeg from “fields fertilized with pig manure”. The Council’s admission shows that its producers have violated provincial environmental laws for years as regulations stipulate that no livestock manure may be discharged into surface water, a surface watercourse or groundwater. The Manitoba Pork Council ad, which appeared in The Sun on Saturday, June 10, states that only one per cent of the phosphorus loading of Lake Winnipeg “comes from fields fertilized with pig manure.” This constitutes yet another admission, first made by the Pork Council in 2006, that the province’s ILO hog producers have been breaking Manitoba law for years. Sections 11(1) and 11(2) of Manitoba’s Livestock Manure and Mortalities Management Regulation state: “11(1) No person shall handle, use or dispose of livestock manure, or store livestock manure in an agricultural operation, in such a manner that it is discharged or otherwise released into surface water, a surface watercourse or groundwater. 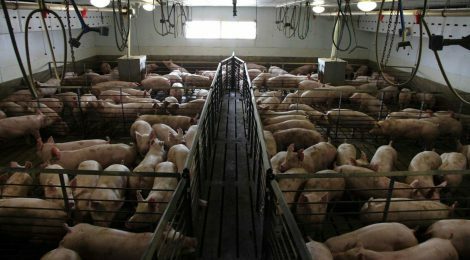 ensure that livestock manure that is handled, used, disposed of or stored in an agricultural operation is not discharged or otherwise released into surface water, a surface watercourse, or groundwater.” This regulation clearly prohibits any nutrient transport – not even one per cent – to waters from agricultural operations, including ILO hog barns and their associated spread fields. No exceptions. Had I the courage of the early 20th-century Italian economist Achille Loria, I would say that rarely in Manitoba legal history has juridical suicide been committed with greater solemnity or conviction. In November 2006, the Manitoba hog industry issued a full page advertisement announcing to everyone that their contribution to Lake Winnipeg pollution was one per cent. Later they increased that to 1.5 per cent. The Clean Environment Commission of 2007 did not make any precise estimates, but did comment in their final report that it was more than 1.5 per cent. Livestock Manure and Mortalities Management Regulation, but it has been totally ignored by the province. No enforcement action has been taken for the past decade. This means that the bold headlines advertising that “Manitoba Farmers Will Still Follow the Strictest Regulations in North America” and “Manitoba Hog Farmers Have Always Been Part of the Solution” are strictly for the purpose of propaganda. For the MPC, it seems that confession is the path to absolution.